I was amazed last week at the cloud of mosquitoes buzzing in my wake as I hiked in a wooded park in southwest Ohio. Studies have shown that the relative attractiveness of individuals to mosquitoes varies and I've never been very attractive to mosquitoes. However, the enormous swarm following me through the woods could have been organizing an airlift operation! Rainfall for much of Ohio has remained above average throughout this season creating ideal conditions for mosquito reproduction. Couple this with mosquitoes testing positive for West Nile Virus in several areas of the state, and we have good reason to double-down on recommendations to protect ourselves from these nasty biters. 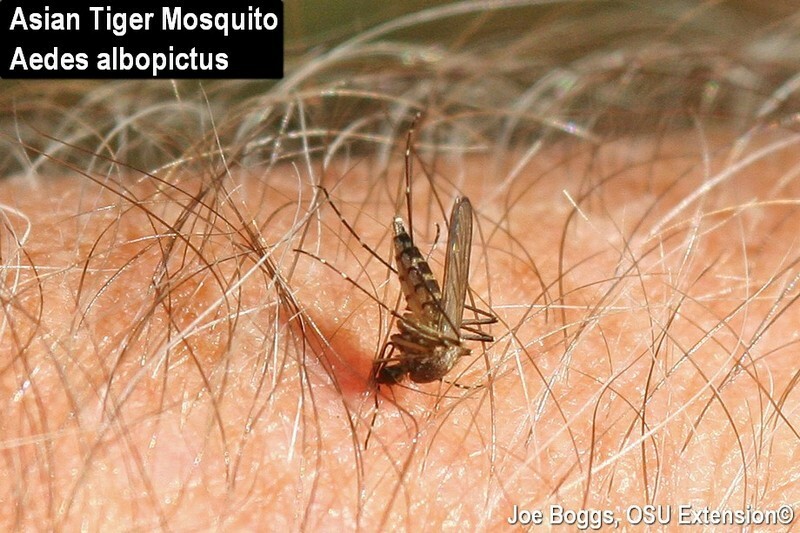 Many of the more common mosquito species found in Ohio will readily reproduce around or near homes, and these mosquitoes may not stray far from their breeding sites. So prevention begins at home. Mosquito larvae, or "wigglers," require some form of moisture to survive. Even temporary standing water will serve the purpose. Mosquito breeding sites will be revealed by a slow, close inspection around homes. Stagnate pools of water in ditches is an obvious mosquito generator as are outdoor toys and potted plant trays that collect and hold water. Less obvious are clogged gutters and downspouts or gutters with poor drainage. Rain gutters are installed with a slight slope towards downspouts; usually around 1/2" for every 10 feet of gutter. It's generally recommended that if gutters run more than 40', they should be elevated in the middle and pitch downward to downspouts at each end. Unfortunately, it's common for gutter slopes to become compromised with age or by ice or snow loads during the winter. Changes in slope that cause gutters to hold water may be difficult to detect from the ground. However, I'm not recommending that you climb a high ladder to inspect gutters; you should consider seeking the help of a professional. Remember it's not the fall that will hurt you, but the sudden stop at the end! Besides, professionals have the proper tools and expertise to assess and repair gutters; you want the fix to be effective and long-lasting. The mosquitoes will be watching. A number of larvacidal products are available for controlling mosquitoes where permanent pools of water are part of the landscape, such as aquatic gardens. The products are based on two naturally occurring bacteria: either Bacillus thuringiensis var. israelensis (Bti) (e.g. VectoBac, Aquabac, Mosquito Dunks, etc. ), or B. spaericus (e.g. VectoLex). These products can be highly effective; however, users must read and follow label directions for maximum effect. We have little control over all mosquito breeding sites. A number of species will readily breed in water held in tree holes. Indeed, the Eastern Treehole Mosquito (Ochlerotatus triseriatus) is so named because it is commonly found in these sites. So, mosquito repellents are an important option. The search continues for the most fool-proof, ever-lasting method to fend off mosquitoes, but BYGL readers are urged not to hold their breath for a miraculous answer. Mosquitoes are attracted to carbon dioxide exhaled by large animals (e.g. people). Dark clothing as well as certain floral scents in lotions and soaps also serve as "eat here" signs to mosquitoes. Insect repellents may provide some relief from mosquito bites. Products containing DEET (N,N-diethyl-meta-toluamide) (e.g. Deep Woods Off!, Repel Sportsmen Max, Backwoods Cutter, etc.) have long been effectively used to repel mosquitoes. However, two other effective compounds have been added to the repellent arsenal in recent years: picaridin (e.g. Cutter Advanced Sport Insect Repellent, Sawyer Picaridin, Natrapel Picaridin Insect Repellent Wipes, etc. ), and oil of lemon eucalyptus (e.g. Cutter Lemon Eucalyptus Insect Repellent, Repel Lemon Eucalyptus Insect Repellent Spray, etc.). Remember that insect repellents are not fool-proof or ever-lasting, but they can provide some protection and relief from buzzing blood-suckers that may carry serous disease causing pathogens.